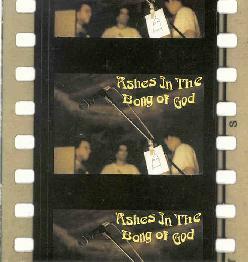 The first release for the millennium – “Ashes In the Bong of God”. The Great Singularity is explained- Mournebong, Stonebringer, Bongscientists, and many more mysteries are revealed. Additionally, there are two editions of this beast. The United States edition has been released by Fleece records as a CD with an exclusive bonus “Live” version of “Airplane” originally produced for KFJC-FM. The German LP pressing is a double album with a different bonus track from the same KFJC-FM session – an album side cover of Kraftwerk’s “Hall of Mirrors”. Both editions will feature different cover designs. Why you ask 2 different bonus tracks and covers? Basically the Kraftwerk cover was too long for the CD edition and it was decided that giving each version their own bonus was kinda cool- the individualized covers grew naturally out of this idea. The project itself began with a suggestion by Camera Obscura’s Tony Dale to use the practice tape material in a release and the whole thing balloned from there. Before anyone knew what happened a simple collection of songs were framed by instrumentals and narration….OH MY GOD! ITS A CONCEPT ALBUM! Not surprisingly, what had started as a very simple “dump the songs in order” proposition is coming out almost a year after it was initially conceived. The delays were mostly due to subtle mixing problems that caused many hours of work at The Dunlavy’s studio – but the appropriate “headphone listening mix” was finally achieved after many months. This collection is definitely the band at it’s most psyche. The Man – Here the Archeologist is slowly melting into a stupor from the truth serum injected by the G-Men. The stupor leads to random drug induced mutterings leading into him standing up from his chair to proclaim who is or is not the man. Meanwhile, the G-men quietly wait behind the glass for the initial wave of the drug to pass. The Eye of God – The G-Men, upon seeing the initial wave pass begin recording. The perspective changes from the clear recoding made of the G-men to a drug induced 1st person perspective of the Archeologist as he recounts his first encounter with the great singularity. The Birds of the Amazon – Cut to a scene of the Archeologist in the Amazon years ago in his quest for the great Bong – Mournebong. Two Artifacts – Here the Archeologist explains the origin the two artifacts Mournebong and Stonebringer, the planet from which it came, and the grand philosophical schema surrounding the Bongs. Bongscientists – The Archeologist explains the arrival of the inhabitants upon a primordial earth, earth’s early inhabitants, and how the Bongs of power helped defeat the evil bugpeople. Grrrl – The title comes from the code broken via bong-meditation by the armies of men against the bugpeople. GRRRL simplifies to 718181812 or more importantly into a binary of 101010110011101001010110110100 – the bugpeople’s genetic root. The bug people, having realized the danger upon Hrothgar son of Healfdene’s breaking of the code, threw their full military might behind one massive assault upon outpost that housed the primitive laboratory. Many humans died in the assault but not before Hrothgar was able to achieve the proper shockwave emitted at a frequency from Mournebong that shattered the genetic structure of the Bugpeople. History – The remainder of human history and its relation to the bongs of power (specifically Mournebong) is recounted by the archeologist. In the introduction you hear Scott Grimm playing the government interrogator. If you listen closely in “The Man” you can hear Clinton jokingly berate Ramon (balancing a glass slide on the guitar to create a drone) for doing nothing. 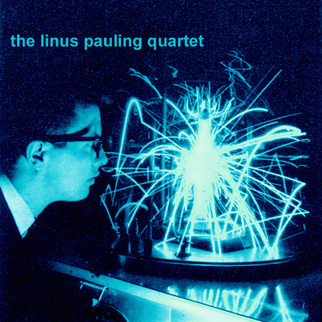 The fourth album from Linus Pauling Quartet stares deeper into the cosmos than any of their previous attempts. Where earlier outings have included the occasional catchy pop ditty and shiploads of majestic Sabbath riffdom, this one primarily heads out on dreamier trajectories. But you don’t have to worry, these Houston rockers still have their sense of humour intact, along with an unequalled knack for peppering their forays into the space-dope-epic format with a healthy dose of irony. Actually one could describe this as a concept album of sorts, with the idea of the Great Singularity being the binding link. The Great Singularity is supposed to be the one thing that connects all in the universe, sort of like the Force only not. The story LP4 is expanding on here focuses on the idea that smoking inhuman amounts of pot is the only true way to achieve that higher level of consciousness. As so many times before with these nutty kids, there exists an extremely fine line between genius and stupidity, but in my world there’s not really any question which side of the fence these space rockers fall on. Opener “The Man” starts with some amazing sax work from Charlie Ebersbaker, implying we’re about to enter the aural gates of free jazz heaven. But the quiet guitars in the background suggest that it’ll evolve into something different, and that’s exactly what happens as they build up and reach groove rock momentum, the vocals repetitiously proclaiming, “He’s the man!” “The Eye of God” is a shorter piece with manipulated spoken word over layers of oozing synth and moog. One of the finest things here is the all instrumental “Birds of the Amazon”, with intricate guitar work spiralling its way around your body before it creeps into your encephalon and never lets go. More groovy but still plaintive rock comes in “Bongscientists” while “Grrrl” is the first truly stomping riff-drenched thing in the bunch, completed when Larry Liska goes off on his kit with incredible intensity. It works as a revelation of sorts before the sax-guitar-batterie-synth jamming “History” marches out of the speakers with intergalactic spoken word hovering over it all. Then comes the lengthy, hard-driving masterpiece “Helicopter in Tunisia” that seems to be built around the same cyclical chord structures that come back time after time. I just don’t know how they pull off ten minutes of repetitious guitar work like this, but please trust my humble opinion when I say this one will leave the kind of stupid grin glued to your face that only a rawk song can. The closing “Airplane” is exclusive for the CD edition, which is a pity since this also is a bloody fine piece of work, slowly making its way from a melancholic pop gem to a complete guitar freakout.